It’s not often I’m happy to see a bureaucrat leave their job. That’s not entirely true, I would like to see every bureaucrat leave their job and would cheer wildly if they did. But I’m cheering one specific bureaucrat leaving his job because he was particularly dangerous at it – Food and Drug Administration Commissioner Scott Gottlieb. Why would I, and why should you, care that the head of the FDA has given his notice? Because, if you’re like me, or care about anyone in the future who might be, his resignation might just save lives. Like too many people, I smoked. I smoked too much and for too long. There is nothing dumber than an 18-year-old boy, and nothing more self-destructive. I started out of boredom and was hooked. Boys between the ages of 16 and 24 think they’re 10 feet tall and bulletproof, and we convince ourselves that we’re too smart to get hooked on anything. We can quit whenever we want. Did I mention we’re stupid at that age? By the time I started to care, I was hooked. By the time I was ready to quit, it seemed past the point of no return. Nothing worked because everything was somehow tied to smoking. Driving, drinks with friends, writing, food – you name it and there was a cigarette involved. I wanted to quit but everything I tried, every gimmick quickly failed. Then I saw a coworker vaping. I tried it and found my way out. Immediately. After having worked my way up to nearly 2 packs per day, I had my last cigarette on the day I was married 3 and a half years ago. I have been vaping, more or less, ever since. The smell is gone, the cost is gone, and the danger. The damage I did isn’t, but I’m no longer making it worse. I’m not unique, not even close. I personally know dozens of people who’ve quit smoking with the help of vaping. Nationwide, it has to be in the hundreds of thousands, if not millions. Quitting smoking was the goal government sold us through public service announcements and we’d finally found something that worked and, in typical government fashion, there came a push to make it harder to get. Gottlieb, for reasons known only to him, decided to target e-cigs, as they’re called, because kids were reportedly using them. Don’t get me wrong, they shouldn’t be available to children, just like cigarettes. But the Gottlieb FDA decided to institute regulations to “protect children” from the scourge of water vapor, and in the process made it more difficult for everyone to get what a recent study shows to be the most successful stop smoking product on the market. On his way out the door, Gottlieb proposed a rule banning the sale of flavored e-cigs in places kids under age 18 can enter. This would pretty much limit sales to “head” shops, which are the adult bookstores for stoners. It will mean these products will be harder to get and will likely lead to fewer people quitting and some people who’ve quit returning to tobacco because they won’t be able to access the bridge (Gottlieb accurately refers to it as an “off-ramp”) they’re using very easily or, in some cases, at all. There’s a reason it’s important to sell vapor products on the same convenience store shelves as cigarettes. Smokers buy cigarettes where it’s convenient, out of habit. If you want them to quit, you need to make e-cigarettes just as convenient. You need to meet smokers where they are. The Gottlieb rule would force habitual smokers to actively seek out vapor products in stores they’ve never visited; it’s not just impractical, it’s stupid. The idea that only young vapers use flavored products is laughable. 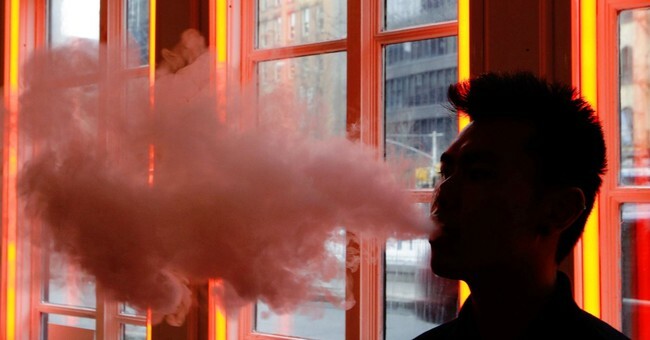 Just as many adults choose flavored vodka, adult vapers prefer vaping flavors. If government starts restricting flavors on the basis of preferences of people who shouldn’t be using them, why is FDA keeping mint and menthol on convenience store shelves, when those flavors constitute a majority of the vapor flavors preferred by underage users? With Gottlieb leaving, there’s a chance this proposed rule will be pulled. It should be pulled. I say this as someone who won’t be impacted by this, this is directed toward flavored juices thought to appeal to kids – Cinnabon, cotton candy, etc. I use tobacco flavored cartridges. But I have friends who do use the flavors and I don’t want to see them backslide because they have to find a government-approved shop rather where they should be sold – where the market demand is: where cigarettes are sold now. On Friday, Gottlieb took his destructive power trip one step further, declaring that if teen vape use doesn’t drop this year “We'll have to look at the pod-based cigarettes as a category and potentially take them off the market.” First, the refillable juice dragged from the market, next everything else. It’s almost like he wants people to keep smoking. If this new rule stands, it would show they just might. It would show they’d much rather have the revenue from tobacco taxes than non-smokers. Vaping works, it helps people quit smoking; I’ve seen it and experienced it first-hand. With less than a month until he leaves office, Gottlieb’s regulatory temper tantrum on his way out the door needs to be killed so more people aren’t.